Streetscape, which usually is funded by the local government, homeowners association, subdivision, or business improvement district, often is an important element in the revitalization of a business or residential district. This page really is aimed at commercial districts, but if you want to make a statement in a residential area, adapt some of these same ideas. Streetscape is just a catch-all term for anything and everything in the public realm along a street. Technically the public realm could be anything between the edge of street or the curb, if there is one, to the private property line. 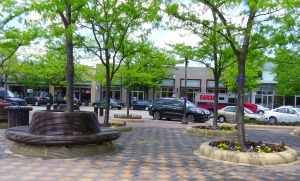 Street trees, sidewalks, benches, landscaping, street lighting, and business district amenities all contribute to the streetscape. After several experiences of planning, supervising the construction, and watching the results of such a program, I think it's best to regard installing extraordinary sidewalks, ornamental street lighting, benches, and trash cans as beautification. But it's beautification in order to promote new economic opportunities, new places to socialize and linger, and increasingly an opportunity to encourage alternative transportation and stormwater absorption. Businesses, residents, and visitors stand to benefit, but the streetscape project must be carefully executed if it is to justify the construction cost. So if you need to set yourselves apart from another residential or business district, then you may want to investigate the cost and engineering feasibility of a new streetscape. Well-coordinated improvements in the public realm can create a unique sense of place and call attention to both the history and the future of a neighborhood. They are indispensable in a commercial district revitalization. A good streetscape makes pedestrians as comfortable as possible. After all, leisurely local shopping or visiting with neighbors are both community-building activities. If you have hot weather where you live, you'll need shade. Street trees are ready-made for this, although if you intend on their giving shade, they need to be selected to have a shape that offers a canopy. Columnar shapes don't provide much shade. Order trees as large as your nurseryman thinks practical, and as large as you can afford. Twigs don't impress people too much. Any supportive tree rings, which prevent the small tree from being snapped off, and your tree grates, which allow watering to reach the roots, should be carefully thought out to match or complement the material you are using on your benches and other elements of the streetscape. The other benefit of street trees and landscaping is that they provide a welcome bit of unpredictability. Organic shapes from plants offer infinite variety and provide curvaceous lines, stubborn imperfection, and glorious color. Plan for year-round color, by the way, from foliage or woody shrubs if not from flowers. Also consider very strongly whether foot traffic, dogs, road salt, and pollution from cars will damage any landscaping you plan. And avoid monoculture, the practice of planting all one species. The reason is that if disease strikes, then you might be left with no street trees. Consider carefully what happens to the trees in various seasons. You don't want the street department to complain for two solid months about the pods, seeds, and leaves they have to clean up. I'm not saying the trees must be evergreen, but be careful with the type of leaf sweeping operation you're creating for yourself. Check out whether those beautiful flowers in spring will fall off and make a slimy mess on the sidewalk when they're past their prime. Geoffrey Donovan, a Portlander who has researched trees, shows that the rental value of housing increases with a street tree nearby. People actually preferred their street trees nearby rather than right in the middle of the property. We think folks want the front of their building to be seen. Another little gem from his research is that large street trees actually accompany low crime, whereas small trees near homes are associated with higher crime. For much more about selecting and maintaining the trees in your entire community, check out our terrific interview with Ian Leahy of American Forests on tree canopy. If all of these cautions about street trees discourage you, another shade possibility is an awning program or shade structures to fill awkward spaces gracefully. These also might shelter a splash fountain for the kids or a place for the grown-ups to dabble their feet in the water. Landscaped parkways or tree lawns (the area between the curb and sidewalk in a typical neighborhood or business district), landscaped medians, potted plants for sidewalks and street corners, and landscaping borders along the fronts of vacant lots also should be considered as part of your streetscape. In fact, if you are reading this page as part of a commercial district revitalization effort, you should consider seasonal ornamental plantings as a necessity. If your community is interested in rain gardens or grassy swales, as opposed to routing stormwater runoff directly along a curb and into an inlet system, your streetscape program definitely could include such improvements. This approach is called green infrastructure, and is being fairly widely adapted in city neighborhoods. The rain gardens (consisting of plants that enjoy being very wet or flooded) or swale, a depressed area ideally planted with water-loving grasses, filter out the sediment and some pollutants from the stormwater. Also they slow down the water, which decreases velocity, leading to less damage from any flooding that might occur. In fact, a large and well coordinated green infrastructure system could be considered a flood prevention system. A streetscape program then may include replacing the sidewalk, often incorporating a new color or pattern into the concrete or pavers. Sometimes also to make the street more pedestrian-friendly, the sidewalk is extended further into the street at the ends of the blocks, thereby shortening the distance the pedestrian has to travel from curb to curb. These may be called bulb-outs, or a variety of other terms. Such techniques really add to making yours a walkable community. Beware of exquisitely detailed sidewalk patterns, as it may be very difficult to make the pattern look right at each doorway. That's not to discourage you from a geometric pattern, but just beware that store and office entranceways require a considerable amount of planning and coordination with property owners. Regardless of how careful you are, it's possible that the design simply doesn't coordinate well with the shop or office doorway. Paver stones, whether real or synthetic, also might be incorporated as accents into the sidewalk if your community favors the smooth concrete approach to most of the sidewalk area. Often the curb is left its natural gray concrete color, with the actual sidewalk taking on a different hue. Glitter may be mixed into the concrete for entertainment areas, and many colors of concrete are possible. It's best to mix the concrete color or additive all the way through the mix rather than apply a thin veneer on the top. It's also possible to obtain striking color effects with asphalt these days, and you might want to try mid-intersection logos or place-relevant patterns. Use a search engine to find the imaginative examples now available. Next you need to consider outdoor seating. Make the benches sturdy and serviceable, because if you install something that can be easily stolen, vandalized, set on fire, or otherwise rendered inoperable, it may be only a matter of time before that happens. Make sure the park bench or other seating is as comfortable as possible, given that it likely will be metal. In most situations you are trying to encourage sitting together. Arrange benches in a pattern that will be comfortable for users. In other words, think about how close people in your culture would like to sit across from or next to strangers. Also consider carefully whether people want to rest near heavy traffic or a busy bus stop. Bus shelters should have their own utilitarian benches and not be part of the streetscape beautification. Some places have been inventive and created sidewalk pavers that look like a rug between two facing benches. So let your imagination rule for awhile, and then bring it back down to earth with brainstorming all the possible downsides to your plan. If your area might become a homeless hangout, or already is one, consider installing the benches with divider arms, so that a person cannot lie down on the bench to sleep. Incidentally, street furniture could include tables also, if you want to encourage people to eat and drink, check their phones and tablets, or even play chess or checkers, in a plaza or wide sidewalk you are creating. Benches seem to bring out candy wrappers and other litter, so plan for trash receptacles and determine how they will be emptied. Consult with those who will pick up the trash before you choose a design; some are considerably easier than others to empty. You may want to have a trash can on a corner even if there is no bench. You don't want packaging and receipts blowing around your business area. Another amenity to consider is the bicycle rack. If you have the kind of community where people feel safe leaving their bikes, you can encourage stopping for a cold beverage or a cup of coffee if there's secure bike parking. A bikeable community is very desirable now, due to the flexibility of the bicycle, the desire for outdoor exercise, and concerns about greenhouse gas emissions from over-dependence on automobiles. Consider too that the bicyclist has more time to absorb the atmosphere and be attracted to shops in your business district. Depending on climate, you may need to install a drinking fountain. In some neighborhoods, the kind with the low bowl for dogs is popular. Fountains go a long way toward making a shopping or employment area friendly to pedestrians, but also they can be a real maintenance headache if you don't have a regular maintenance crew to address the chewing gum left in the fountain and to make sure they are correctly weatherproofed when temperatures dropped below freezing. Our best advice for making the decision about drinking fountains is to think carefully about your climate, the particular customers you are trying to attract, and the availability of cold beverages at a reasonable price in nearby businesses. During your streetscape program, you also might want to consider public restrooms if that is a need in your town. If you go to the expense of making them available and maintaining them, give us a discreet sign every once in a while to show where they are. New street lighting is a very common element of a streetscape program, as wiring can easily be installed or moved to accommodate the new bases when sidewalks are being replaced. Read our page for more detail on the topic. You also may need an electric vehicle charging station in a smaller commercial area. In large shopping or employment centers, we think those should be placed in parking garages. Design your streetscape with future transportation modes in mind. The likely deployment of driverless cars, also called autonomous vehicles, in the near future means that you will need much more temporary drop-off space near popular destinations, and a gradual decrease in longer term parking. To understand more about the implications of this technology, please see our page about driverless cars and their impact on planning. We think that the neighborhoods and business districts that plan for the upsurge of ride hailing, electric vehicles, and autonomous vehicles will have an important competitive edge over those that don't. Your program also might include less common features, such as public art, ornamental fountains, or amphitheaters as gathering places. A couple of links at the bottom of the page will give more information. As you're planning streetscape, look at your signs and awnings again. Attractive signs to help visitors find their way around are always welcome, as are signs pointing out historic sites, important government offices, and parking. If you have electric vehicle charging capability, a small sign mounted on an existing pole could let your visitors know where to find it. If you work with a professional, they will call this "wayfinding" signage or a wayfinding system, which might involve pavement colors, for example, instead of signs. You can contract with a graphic artist to design attractive interpretive signs with vandalism-resistant coverings to explain your history. You aren't limited to brass plaques. These signs would be oriented toward pedestrians rather than drivers. If you're interested in a common signage program, where each business has a small perpendicular sign of a common size extending out from its front door, for instance, this is the time to implement that program. Uniform awning programs work well with new streetscape too. Sometimes special business districts or business improvement districts subsidize the awnings for individual merchants. A city government may sponsor an awning program productively as well, either by outright grants or through a loan program. If you decide that there is no financial assistance for businesses, you might just agree on a common color, or very small list of colors and designs, so that as private building owners replace awnings, they begin to harmonize with the environment. Usually these color and design choices would be part of local design guidelines suggestions or legislation. If you investigate the choices and feel that your community can't afford any of the options, look carefully at some plain wood garden benches, that can be backed up to the storefronts and bolted down. Also check into large pots or half barrels that can hold annuals. Something inexpensive such as petunias or another flowering annual still will add color, motion, and vitality. If you can't afford to color your sidewalk, maybe three times a year you sponsor a chalk painting contest and become famous for it. And keep in mind that I'd rather see a vital business district, where people are continuously going in and out of shops, with a plain old gray concrete sidewalk, than a dead business district with an artful streetscape. That's because people are the very best ingredient for adding color, movement, unpredictability, and interest to your street! In fact, we recommend a book about making your neighborhood memorable in general: The Great Neighborhood Book: A Do-It-Yourself Guide to Placemaking. Another benefit of doing nothing is that a streetscape program, in which the sidewalk is replaced, street trees are planted where there were none before, and so forth, disrupts the business district for a whole season or more. Can your businesses afford to alienate their clientele for two to five months while you pretty up the place? By that time, customers might have found another place to buy a cup of coffee. Now we still think a new streetscape is worthwhile if carefully executed, but the benefit has to be able to justify the cost. If you have one tiny struggling business on a block, that might not be the case. If you decide to move forward with a new streetscape look, plan very carefully to provide for pedestrian safety, comfort, and an understandable system of showing where it is appropriate to drive, park, hitch a bicycle to a rack, and walk. Invent a slogan for your streetscape program and talk about how great it's going to be when it's finished. Then prepare to support the businesses while the renovation is taking place. They may want to plan a festival or sidewalk sale just outside the boundaries of construction to call attention to their district and attract some extra sales. Individual businesses will have to do their part with clever marketing as well.